You'll want your dinner guests to see this impressive pork roast so carve it at the table. Pork Roast: Season roast with salt and pepper. In a small bowl, mix together lemon juice, olive oil, mustard, rosemary, lemon zest and garlic. 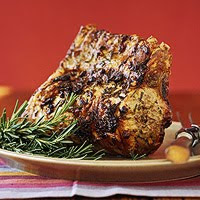 Rub pork roast with lemon-rosemary mixture. Place on a rack in a large roasting pan. Roast at 450 degrees F for 20 minutes. Lower oven to 325 degrees F and roast for another 1 hour and 5 minutes or until internal temperature registers 155 degrees F on an instant-read thermometer. Let rest for 10 minutes before slicing. Gravy: Pour off all but 1 tablespoon of the fat in roasting pan. Place pan over medium heat and add wine. Cook for 1 minute, scraping up any brown bits from bottom of pan. Sprinkle flour into pan and cook for 1 minute. Gradually whisk in chicken broth and bring to a boil. Cook for 2 minutes, whisking constantly. Whisk in preserves. Strain into a small saucepan; keep warm. Slice meat (photo bottom right) and serve with the warm gravy on the side. This entry was posted on 1:49 AM and is filed under Gravy . You can follow any responses to this entry through the RSS 2.0 feed. You can leave a response, or trackback from your own site.